Wood changes its size when its moisture content changes. The size change is different along each of the planes of wood growth - radial (R at right), tangential (T) and lengthwise (X). So, it's important that woodworkers know when the moisture content of their wood has reached equilibrium with the workshop, so that its dimensions have settled down. What is the moisture content (MC) of wood compared to its dry weight? Typically 60% for green hardwoods, up to double that for softwoods. The moisture is in two forms - chemically bound and free. 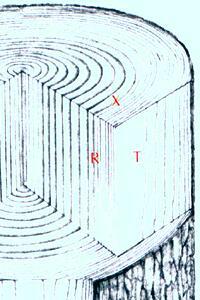 The first aim of seasoning lumber is to degrade the chemical bonds to water, so that all that remains is free to move. This happens faster at higher temperatures, which is why kiln drying saves so much time. However, too-high kiln temperatures degrade wood, and most kiln drying is done as quickly as possible to produce cheap construction grade softwood. That's why kiln drying has a bad name among instrument makers. Skilled kiln drying can actually produce better wood than air drying. When wood is air dried, the outside dries faster than the inside, and this results in residual stresses in the wood. If the kiln humidity is controlled to match that of the wood throughout the process, and the high temperature is used just to speed up the rate at which the chemical bonds are degraded and moisture equilibrium is reached, residual stresses can be significantly reduced below those of air dried wood. But, there is no way to know, just looking at a piece of wood. L is the length along the direction of diffusion. t is the time to 1/e of the moisture change, that is to 63% of the equilibrium change. So, if you have a piece of seasoned wood 2 cm thick that is at the 15% MC of typical outdoors storage , and you want to estimate how fast it will come to equilibrium in your workshop at 30% RH (7% MC) if exposed to air both sides, L = 1 cm and the diffusion equation gives t = 1x106 s, 11 days. The equilibrium MC change required is 8%, so in 11 days you can expect 63% of 8% = 5% lower MC, that is 10% total MC. That leaves 3% to go, and you can expect 63% of that 3% to take place over the next 11 days, to 8% MC. So, 3 weeks should be enough time for 2 cm thick wood. If your wood is 4 cm thick, it will take 3 months, 6 cm thick, 7 months. According to the literature, most seasoned temperate woods change moisture at a rate within ±20% of this. The fact that moisture moves ten times as fast lengthwise as crosswise is why a green log left in a dry place develops so many cracks (checking) at the ends - the ends dry faster, so shrink faster, than the middle of the log. To prevent this, coat the end grain with something that stops evaporation, such as thinned parafin wax or commercial sealers. Above the fiber saturation point, moisture moves in wood by capillary action, faster than by diffusion. And, initial wood shrinkage varies more with species than seasoned wood movement. It is common practise to leave a high value log that is to be air dried out in the woods for a year to keep it moist, even to submerge it in water for the first year, to reduce splitting caused by too-rapid drying during the capillary-flow stage. This technique also tends to even out wood colour, useful for dark coloured woods such as walnut. rho is the specific gravity (density) of the wood. So, in adapting from 70% RH outdoors to 20% indoors, MC changes 10%, from 15% to 5%, and a wood of density 0.45 shrinks about 10% of 0.45, 4.5% in volume. The change in dimension tangentially will be about 64% of the volume change - 2.9%, the radial change 36% of the volume change - 1.6% (again, ±20% for most woods). Don't rely on measurements by electrical methods to better than ±2% absolute moisture content, no matter what a manufacturer claims. (C.Skaar, "Wood-Water Relations", 1988, discusses many variances which affect such resistance measurements.) Volt-amp-ohmmeters are carried by many electronics stores, but almost none have a resistance range high enough to measure the MC of any but the wettest wood. Wood takes longer to come to equilibrium at its center than on its surface, so for thick beams the surface moisture measurements of the pin meters are less accurate. They are less accurate for wood that is less than 20 mm thick. It's not easy to push pins into hardwoods. And, the wood is damaged by the measurement. A better method for the wood used by instrument makers should be to make two flat electrodes, press them to the surface of the wood, one each side, with a woodworkers clamp, and measure the resistance between them. Unfortunately, it doesn't work, because a flat plate can't make adequate contact with the wood fibers unless pressed on so firmly (>10 kg/cm²) that the wood is crushed. Various conductive pastes are available, such as the kind doctors use for electrocardiograms, but I have yet to find one that doesn't hopelessly stain wood. However, what is most important for woodworkers is whether or not the wood has reached equilibrium in the workshop. Successive thickness measurements of the same piece of wood can tell you that directly, without any electric gadgets. You will need a dial caliper that will measure to a few tenths of a percent. Then, mark the exact place where your measurements are being taken, and don't lose your piece of paper you write the numbers on! Of course, if you want to check any of this, cut a piece off your wood, weigh it, then dry it in an oven until it stops decreasing in weight. Then you will know precisely how much moisture there was in your sample. That's how scientists do it.